Here is my story for this week’s Friday Fictioneers, a 100 word photo prompt hosted by Rochelle. This week’s photo was contributed by Dee Lovering. Don’t forget to click on the blue froggy to read all the other stories! The residents of Clusterdale awoke one morning to find their little township draped in a thin layer of white. Children were ecstatic. What fun they would have! Adults looked out of their windows suspiciously. It was too warm for snow, surely? It was mid-summer! Was this the effect of global warming? A new ice age? Was the End come at last? Children laughed, not understanding the worried looks on their parents’ faces. Across town, fire fighters reeled up their hoses. The massive overnight explosion at “Walker Brothers Icing Sugar Packing and Distribution” would be talked about for years to come. Funny twist at the end there. I guess the kids haven’t yet tasted their “snow”. They’ll be even more ecstatic when they do! Another giggle. Thanks for that! Nice one! Great humour – made me giggle. I laughed out loud!!! Thank you, thank you, thank you! 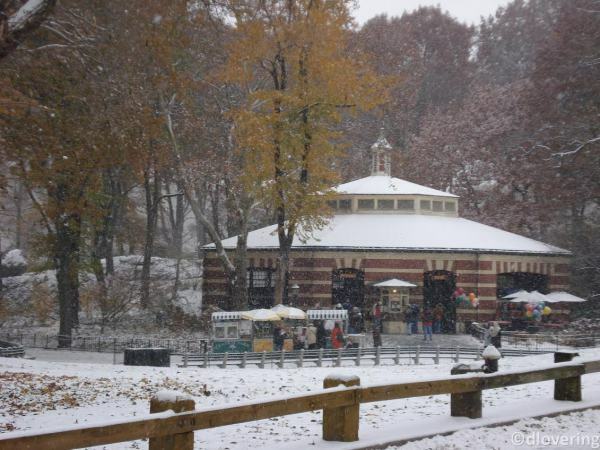 The carousel in Central Park????? Sure looks like it to me. To say nothing of the days-long sugar high of eager young clean-up volunteers and resulting chaos in ill-fated Clusterdale! LOL 😀 That’s some sweet snow! I like it! I’d like it too. So will the local dentists! Yummy snow! Must have been fun! I bet it was. Until the tummy ache set in! Thanks! I had terrible trouble with the final paragraph. When you know what you want to say but it never sounds quite right. We did have similar takes with our stories but you turned yours on it’s ear. As a cake decorator who’s daily coating in icing and sugar I find this disturbing as well as amusing. Love it. I mentioned the same thing on your story! Out of control icing sugar must be disturbing to a cake decorator (especially if this explosion means there will be a shortage!). Now that is brilliant! Snow you can eat! Nice twist! Sounds like a dream come true for my sweet tooth. Oh my, who will catch all those kids when a sugar rush kicks in? Funny story, I enjoyed it. No-one will catch them, they’ll be rushing around far too fast! This is priceless! And a day later, they can play with the sticky stuff coating everything. What fun, turning climate change sweet. Sticky yummy “snow” ball fights! Fun take on this one. Great. You can now make and eat your snowman. Sweet story Ali. The fun never stops in Clusterdale! Don’t eat the yellow icing!!! Ah yes, the snow was too good to be true! Very funny, Ali. We awoke to snow one morning in California. Oh, was it a big deal! Kids loved it, but everything had melted by 10:30 am. Great take. We don’t often get much snow in my neck of the woods either. Even in the awful winter a few years ago when the rest of the country had feet of the stuff, we just got a couple of inches which then froze and stayed treacherously frozen for weeks. Thanks, glad you liked it! We can only hope it doesn’t rain. Ha ha! I love when I burst out laughing at the end of a short story! Sweet! I’m glad the ending made you laugh 🙂 I like to put something funny or unexpected at the end. Awesome! Best summer snow day ever. Oh, that sounds just like my kitchen when i’ve had a marathon baking session – slightly smaller scale version of Clusterdale, though. I imagine it was the nicest tasting snow those kids had ever tried. A fun story, Ali. I think the kids were pretty happy! I read this and didnt think – sweet snow, but rather “Oh no, get ready for a lot of ants!” I take this as a sure sign I am ageing. Ooh, I didn’t think of the ants. This could get nasty! I was just thinking of the awful sludge if it rains. Wait, you’re Millie Thom’s daughter? Wow, a family of writers 🙂 You’re familiar with the kitchen icing sugar explosion scenario, then. Very funny. What a novel take on the prompt! Love it. Sugary sweet story! At first I was tensed at the thought of snow in mid summer, but the end brought back the smile again. Thanks, I like my little twists!